•	Welcome to your ‘Swiss Glory”. On arrival in Zurich clear immigration and customs and proceed to the hotel. •	Today an Optional excursion to the Jungfrau, the ‘Top of Europe’, a wonderful world of glaciers and eternal ice. Onto Jungfrau. Reach the highest altitude railway station in Europe by a charming, red cogwheel train, amid stunning and dramatic mountain scenery ! •	What could be more tempting in this icy cold scenario than a hot Indian lunch ! •	Walk on the great Aletsch Glacier. Visit the Sphinx Observation Terrace. The new Cinema Experience and the new Alpine sensation are attractions, enroute to the glistening Ice Palace. 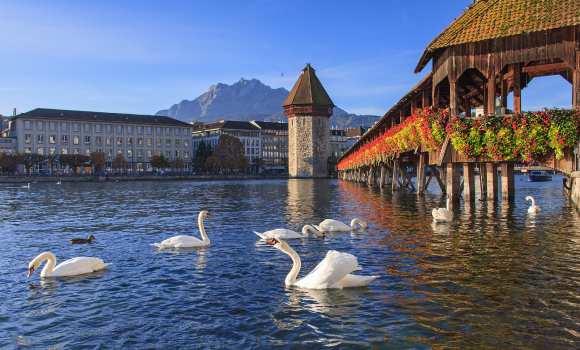 •	Descend to visit the popular holiday resort of Interlaken, cradled cozily between the beautiful Lakes ofBrienz and Thun, where even today you see horse-drawn carriages. •	Indulge in some shopping. Next to a virtually unlimited selection of watches and jewellery, every store carries a vast array of small famous brand gifts and souvenirs, priced for every pocket. •	After breakfast today, we begin our icy excursion as we head to the winter white wonderland that is the Glacier 3000. Apart from the incredibly spectacular views of snow-laced peaks all around, Glacier 3000 also offers a wide array of activities to keep even the most fidgety traveller entertained. From enjoying the winter views during the cable-car ride to and from Les Diablerets to skiing and hiking to the thrilling snow-bus ride to that of the Peak Walk on the world’s only suspension bridge connecting two peaks, there’s something for everybody here. And because nothing brings more warmth to our minds and bodies than a steamy meal, we enjoy a delicious lunch at Glacier 3000 before heading back to Les Diablerets. •	Next we drive and begin our orientation tour once in Geneva. 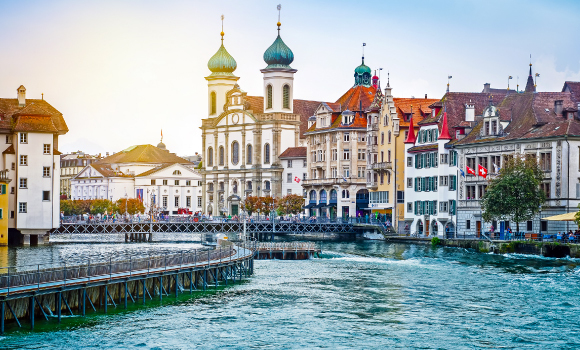 We wander through various popular attractions in the town including the United Nations Headquarters, the Flower Clock, the Old Town, the Jet d’Eau (world’s tallest fountain that sprouts up out of Lake Geneva) and the Red Cross Headquarters among others. •	After basking in the rich cultural and architectural glory of Geneva we make our way back to Leysin. After a sumptuous dinner we return to hotel and sleep tight for the rest of the night. •	Today after breakfast we proceed to a scenic drive through beautiful landscapes to Paris, the 'City of Lights. On arrival in Paris we take a cruise down the famous Seine river that allows us to grab marvellous views of many Parisian highlights including the recently-visited Eiffel Tower, the Alexander Bridge, the National Assembly, the Louvre Museum, the Musée d’Orsay, Notre Dame Cathedral, etc. •	What better way to end our day’s adventures than some mouth-watering food? So, indulge ourselves in a yummy meal and head straight to the hotel to wade off the day’s exhaustion. •	Unleash the child in you for a fun filled excursion ! Thrilling rides, favourite Disney characters and incredible shows make it a complete family attraction. •	Note:Your park ticket gives you the option of entering either Disney Park or Walt Disney Studios. •	The Disneyland, Paris is divided into Frontierland, Adventureland, Fantasyland, Discoveryland which are the four magical themed lands and the ever famous Main Street USA. Thrilling rides, incredible shows, parades, fantasy and excitement guarantees non-stop fun and action. Fairytales come to life. Thrills in all sizes and shapes. Big thrills such as Space Mountain Mission 2, Indiana Jones, Big Thunder Mountain, takes you to the edge of the universe and little ones, where you can sail around the world with “It’s a Small small world”. Family fun is around every corner, from Pirates of the Caribbean to the Mad Hatter’s Tea Cups. Favourite Disney Characters are waiting to meet you. You can ‘Hello’ Pooh, ‘Howdy’ Goofy and meet Mickey and Minnie. Do not forget to take a snapshot with one of your favourite Disney characters! Say “Cheese” and get a photograph accompanied by a hug and an autograph. •	Discover the magical world of cinema and television at Walt Disney Studios where a behind the scenes destination sensation awaits you. Experience movie magic and cinema sets coming to life through cinemagical ‘lots’, featuring thrilling attractions and spectacular shows with your dreams centre-stage allowing your “screendreams” to come true! Make your big screen debut at Toon Studio or Production Courtyard. •	We then proceed to dinner at a top-rated Indian restaurant. •	From here, you could either head back to the hotel or choose to go on a recommendable ‘Paris by Night’ trip that comprises of an Illumination tour and the famous Lido Cabaret show. •	Start the Paris tour taking in the dazzling overview of the city as you ascend by an elevator to the 2nd level of the Eiffel Tower! •	Enjoy a guided city tour visiting famous monuments like the Pyramid of the Louvre, Garnier's Opera, the largest opera theatre in the world, the River Seine, the Place de la Concorde - the site of the infamous guillotine, the Champs Elysees - one of the most fashionable streets in the world, the Napoleanic Arc de Triomphe and the Hotel des Invalides. •	Good times need never end! Your tour ends with guests departing on individual flight schedules for your flight back home. In case Minimum Operating Strength is not achieved this tour can be called off.